“Attar” is a word used to describe any perfume extracted from flowers. Scented attar of roses, extracted from the blooms of roses, was highly desired and very expensive during the Victorian era, which is understandable when you consider it takes 150 pounds of rose blossoms to make a single ounce of fragrance. Thus, geranium attar of rose became an inexpensive substitute for the real thing. Attar of rose geraniums (Pelargonium capitatum ‘Attar of Roses’) and other scented geraniums were initially introduced to Europe by way of South Africa. 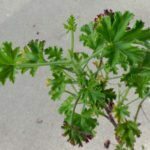 The plants grew in popularity in the United States and became trendy by the 1800s, but as fancy Victorian styles fell out of fashion, so did ruffly attar of rose geraniums. Today, attar of rose scented geraniums have regained a following among gardeners who appreciate them for their attractive foliage and sweet scent. They are considered an heirloom plant. Attar of rose scented geraniums are easy to grow in the warm climates of USDA plant hardiness zones 10 and 11. The plants are lovely in flower beds, patio containers or hanging baskets. Geranium attar of rose grows in full sun or partial shade, although the plant benefits from afternoon shade in hot climates. Plant these scented geraniums in average, well-drained soil. Avoid rich soil, which may decrease the sweet aroma. Gardeners in cooler climates can grow geranium attar of rose indoors, where it remains beautiful all year round. Indoor plants benefit from a little shade in summer, but they need bright light throughout the winter months. Geranium attar of rose is a drought-tolerant plant that doesn’t tolerate soggy soil. Water only when the top inch of soil feels dry to the touch. Water indoor plants deeply, and then allow the pot to drain thoroughly. Fertilize plants every three to four weeks using a balanced, water-soluble fertilizer diluted to half strength. Alternatively, use a slow-release granular fertilizer early in the growing season. Be careful not to over-feed attar of rose geraniums, as too much fertilizer may minimize the scent of the blooms. Pinch the stem tips of young plants occasionally to produce bushier growth. Prune attar of rose geraniums if the plant begins to look long and leggy.